Pubs could run out of Guinness following Brexit, Liberal Democrat leader Sir Vince Cable has said. He warned an extreme scenario caused by a no deal or a very bad deal could lead to the supply “drying up”. The MP was speaking after he and party colleague, Edinburgh West MP Christine Jardine, met executives from global drinks giant Diageo in Edinburgh and discussed the impact of Brexit. The firm, one of the world’s biggest distillers whose brands include Guinness, Smirnoff, Johnnie Walker and Baileys, stressed its products would still be available regardless of the Brexit outcome. He said: “It’s a global business, it depends on having frictionless borders. Anything that screws up their trade is a problem for them. “There are some specific issues, the supply chains in Ireland, for example, go across the Irish frontier - you’ve got whisky going one way and cream going the other to make Baileys. “You can envisage a situation in which Guinness and Baileys, which are the two brands which are the most affected, are seriously disrupted. Any friction at the border which did not stop supplies would result in increased costs, he added. 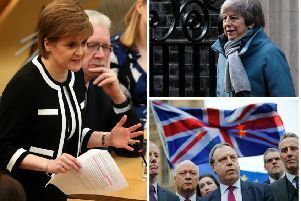 He said these concerns were put across in the briefing from the company and stressed the firm’s importance to both the Scottish and UK economy. Scotch whisky accounts for 20% of UK food and drink exports, according to the Treasury. “The company is very anxious to avoid anything that closes borders. That’s the key message from the company, not just me,” Mr Cable said. Questioned on a Brexit deal being struck within weeks, he said there is “a lot of smoke and mirrors” and European diplomats were playing down expectations of any imminent deal. He said there is widening cross-political backing for a so-called People’s Vote on the final Brexit deal, which his party is campaigning for. A Diageo spokesman said: “We’ve made it clear that a frictionless border in Ireland is the best outcome for every business large and small.